If you're looking for a lightweight exercise machine that won't break the bank, you have found what you're looking for. This dip station will allow you to get an intense upper body workout from the comfort of your own. With its easy assembly and simple instructions, you will be getting that summer body ready in no time. If you feel like increasing your workout with a weighted belt while dipping, there's no worry because this iron metal dip station can hold up to 500 lbs. Its light weight body will allow for easy mobility and its compact size keeps it from taking up too much space. 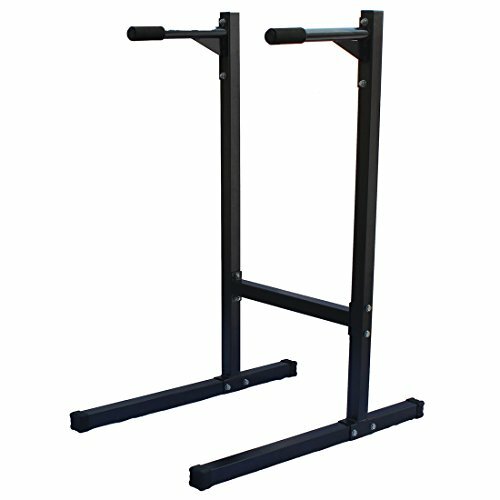 Its sleek black powder finish will make it a great addition to any home gym. Start pumping up those shoulders and triceps with this new dip station. 100% satisfaction guaranteed. Hurry up, and get one of the limited dip station now.